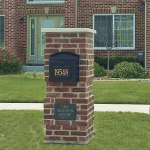 Mailbox Remedies built this custom arched brick mailbox in Orland Park, Illinois. Featuring a Salsbury mailbox and an embedded slate address plaque. 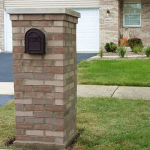 Mailbox Remedies serves Orland Park, The Greater Chicago Area and parts of Northwest Indiana.